Just wondering what your thoughts were on on macronutrient ratios? I.E. low carb, high carb etc etc? I feel like everyone has a relative who broke both dietary dogmas to some degree, whether thats a 100 year old uncle who drank lots of beer and ate potatoes with every meal or an aunt who lived off bacon anc chocolate. Thoughts? 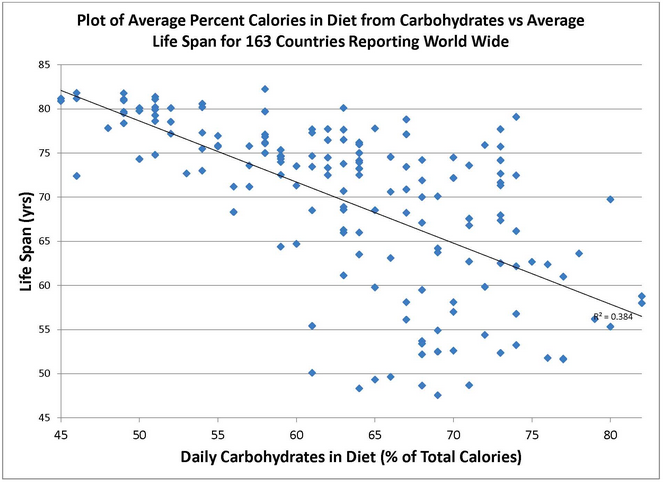 The Med diet macros are pretty well proven for longevity and health, typically 60% carbs/25% fat/15% protein. Paleo is unproven for longevity and health, but in the Cordain version would be more like 40% carbs/20% fat/40% protein range. Neither Med nor Paleo are high fat diets. Again, thanks for all the digging, graphs and discussion @giu. The discussion could go on forever. I may have related this before, but I live in the area once occupied by the Salish Amerinds. 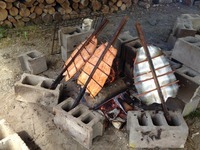 My avatar shows the typical Salish cooking technique for salmon, which you can still find here and there on holidays. The Salish ate a diet which was as Paleo as Cordain could desire - meat, vegetables and fruit with scant starch from nuts and wild bulbs like camas and wapato. Yet the Paleo diet did not prevent the literal decimation of the tribes in the 1830's from a variety of diseases, particularly fever (which was responsive to quinine). It was similar to the Spanish flu and black plague epidemics in Europe, but far more devastating. I like Cordain, but he has a tendency to overreach with his claims on the health benefits of the Paleo diet. CVD is still the leading cause of death worldwide but it now occurs at a later age than in the 1950's. IMO it's due to the loss of muscle mass, particularly in the thighs. My dad died of a massive heart attack at 88. Hiis legs were spindly and weak, and he was very unsteady for the last 5 years of his life. In any case (and this will be my last post in this discussion for now), as of the most recent data, the life expectancy of Greece and Finland is now exactly the same, both at 80.5 years. Both populations are a bit overweight with average BMI of 26-27 and eat over 3000 kcal/day. It does seem that for people in very old age the dominant cause of death is CVD. In the US up until age 70, CVD and cancer cause similar rates of deaths. But after age 90 it seems the death rate is as high as 50% from CVD and just 10% from cancer. We suffer much less from infectious diseases now than in the past, and compared to undeveloped countries. I think this has a lot to do with the higher protein and caloric intake. When 50-100 million people died as a result of the Spanish flu in 1918-1920, it was largely because they were weakened by low intake of calories and protein (as a result of WW1), probably to some extent similar when half the European population was wiped out by the black plague in the 1300s, much of the population were probably eating a diet that the Blue Zone guy, even Keys himself, would endorse, whole grains, legumes and small amounts of dairy and nuts. This is also a serious problem with the calorie restriction. It greatly increases the risk of infections. In a laboratory setting, rodents may live long when they are isolated from these infections/microbes despite a low caloric intake, but in a real life scenario, a human that eat little food may not be protected well from these infectious diseases if he wants to be around other people, travel and so on. Even on paleohacks it seems a lot of people suffer from digestive disorders (caused by bad intestinal microorganisms, in other words an infection) and one cause of this can be a lack of calories. But sure 6000 kcal is too much. Is 3000 kcal too much? Or 2500 kcal? @giu thanks! The studies were focused on reducing CHD, and the behavior modifications to reduce that by 72% are what they were after. Longevity beyond that takes other measures. I still wonder about eating a hypercalorie diet long after the need for it ended. Old habits take generations to change. I forgot about the Finnish salt licorice pastilles salmiakki. Along with the berries they like intense salty flavors. «North Karelians were also realizing that they needed to eat more fruits, but common fruits such as oranges or melons were expensive. They had to be imported from southern Europe, and they played no part in the Karelians’ traditional diet. Puska saw a homegrown solution: berries. 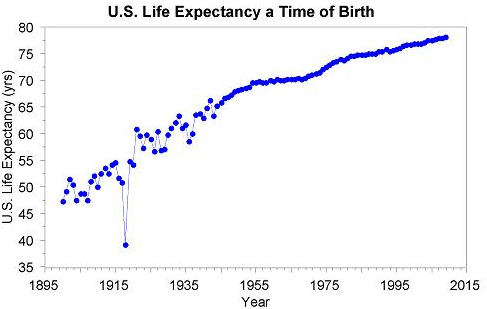 I think the conclusion is interesting: despite all these changes, life expectancy was only increased by 6-7 years during the 25 year period (or was it a 25 year period?) 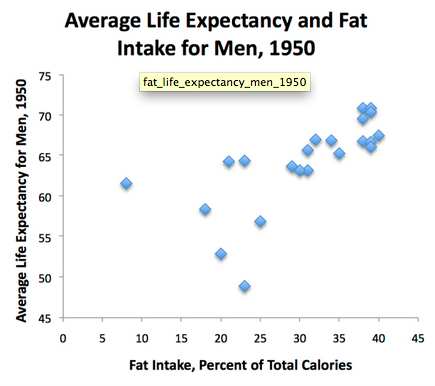 We should remember that even if they had kept exactly the same diet, life expectancy would likely have increased by several years due to medical improvements. Worldwide life expectancy went from 58.5 years in 1970 to 65.2 years in 1995, or 6-7 years. Additionally if they ate 6000 calories due to the extreme demands required by lumberjacks at the time, machines would replace some of this over time and they wouldn´t need to eat so much food. I do think that things like meat, salt, coffee, sigarettes, can trigger heart attacks, due to the lack of potassium and magnesium (and high sodium:potassium ratio) in particular. The question is how much potatoes and milk they ate versus meat and cheese and butter. Milk and potatoes are good sources of potassium and many other nutrients (like choline and pantothenic acid), needed to properly handle all the fats, while cheese is deficient in those. Would it even be possible to get fresh milk in the middle of the winter. I would think traditionally they collected the milk in the summer months and made much of it into butter and cheese (and some yogurt) for storage during the winter. @giu I agree that smoking is drifting away from the topic. 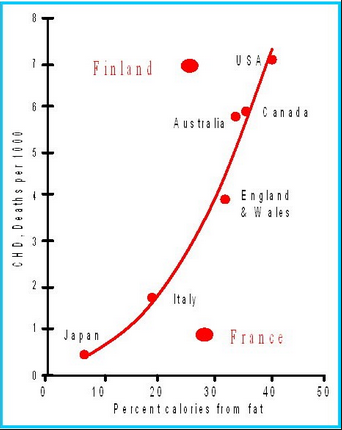 Japan is also an example of high smoking and low CVD rates. When you commence a study of this size it's hard to know where it will end up. 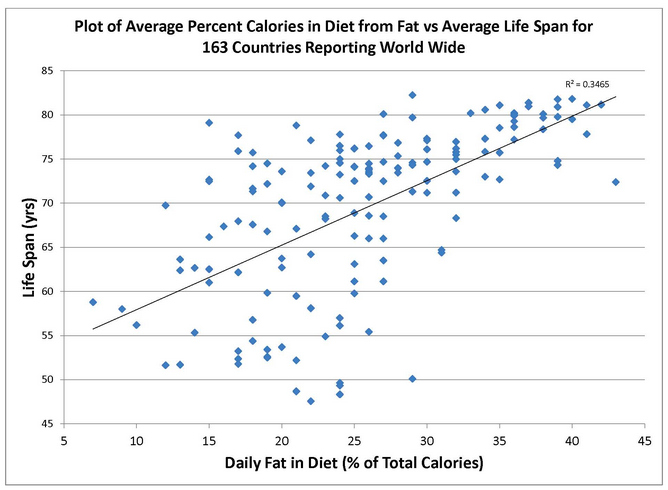 There may be a bad synergy between western diet - both the macros and total calories - and smoking. In regards to fat, Keys was always harsh on saturated fats, both animal and vegetable. He was certainly right to condemn trans fat vegetable shortening and margarine, though for 30 years no one paid much attention. He recommended using high PUFA vegetable oils for cooking in the 1950's, but by the 1970's he had shifted to high MUFA olive oil. This appears to be almost accidental, and related to observation and imitation of the diet he ate daily when he moved to Italy. Sorry I don't have more on the Finnish diet. I've been there a couple times. The reindeer hot pot was delicious, and Paleo if you can accept the potatoes. They really like their wild berries, and eat compotes which are much more sour than I'm used to. The rest of the food was generic Euro. #giu Yes, in regard to smoking I was about to intervene myself. Smoking may suppress the immune system a bit, but it will not affect the gut, it will not affect insulin, and nicotine enters the bloodstream in minute amounts compared to PUFA in oils. 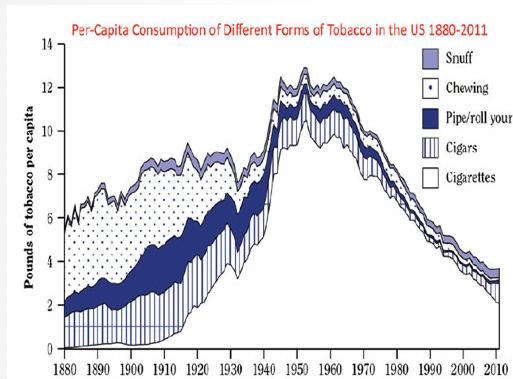 I think modest amounts of smoking are less unhealthy than alcohol, sugar, corn oil and wheat. I searched google for some more info about the Finnish diet when Keys did his investigations, but couldn´t find much information. Do you have a link? I would like to know in more details exactly how much they ate of various food items. As regards smoking, it is important to remember that many hunter gatherers smoke and have excellent health. Staffan Lindeberg found that on Kitava, 80% smoked, and yet the population did not suffer from ischaemic heart disease or stroke. I think he mentions in the book «food and western disease» that smoking appear to be damaging in the scenario of un unhealthy diet, but not on a healthy diet. And it may be the same with sugar, white flour, fats/saturated fats, salt, alcohol and so on. If the rest of the diet is nutrient dense, it may not matter. We focus too much on these nutrients and too little on the healthy nutrients that can easily compensate for the problems they cause. And often it is as simple as adding a ton of vegetables to the diet. In the case of Kitava it would be root vegetables like sweet potatoes, which is extremely high in potassium. They may have obtained 6-9 grams of dietary potassium per day (plus high quantities of other valuable nutrients, of course). @giu here's an interesting bio of Karvonen. A lot of people who worked with Keys were long-lived. Karvonen and McGovern lived to 90, Margaret Keys to 97. I e-mailed Blackburn, who's now in his mid 90's, to get personal details on Keys such as height and weight. Keys outlived his parents by 25 years so I don't think genetics comes in to play. Karvonen had to convince Keys to include Finland, or it would have been only 6 countries. The only country worse than the US. They weren't eating reindeer and salmon in East Karelia. And that hypercaloric 6000 calorie diet! I wonder if that is an important effect. Running your body at high metabolism for decades might wear out the heart from overuse. In the 1950's heart attacks and strokes were the leading cause of death in the US, and Keys was the lead researcher assigned to study this. He had the best nutritional lab in the world at UMinnesota, and samples from the countries were shipped there for analysis. The scope of his project was comparable to the Atoms for Peace (which resulted in nuclear power plants) and interstate highway programs which were contemporaneous. Keys bias against saturated fat may have skewed his project's direction somewhat. But the worldwide data collection and observation yielded tremendous reduction in CVD rates. Just the focus on smoking cessation made it worthwhile. People used to die commonly from strokes and massive heart attacks in their 50's. Not anymore. I´ll definitely check out the data you mention from Finland more thoroughly. Very interesting. In my view a diet of potatoes, milk and fatty pork are fine and nourishing foods, but white flour, sugar and so on in the absence of fruits and vegetables, would cause major problems, such as a deficiency of magnesium, causing calcium issues like atherosclerosis. Agree that Keys may have been treated overly harsh by people like Taubes, after all he did live to be 100. 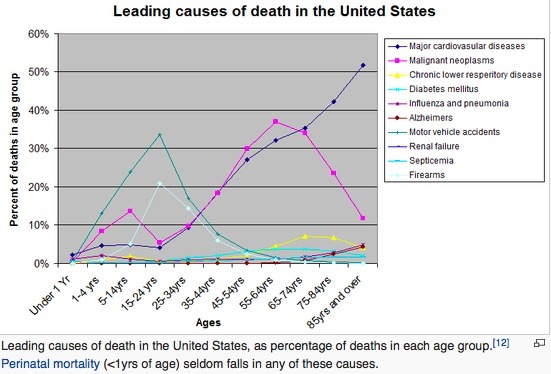 I think the CHD is not so relevant really, what matters is longevity/life expectancy. If you die at age 60 of cancer, then you won´t die of CVD. Jumping off a tall building will reduce your risk of cancer and CVD by 100%. Countries with high GDP/capita often have so good healthcare that these interventions could mean the person would normally on the given diet have died of heart disease, but then the bypass surgery prevented that so he instead died of cancer (perhaps helped by heavy use of cholesterol lowering drugs), or vice versa treating the cancer and then dying 5 years later of a stroke instead. So what you mention about your family members living to 75-85 years, that´s not bad if it was along time ago and is the most important thing. I´ll post two random charts (I just found via Google) to make my point. 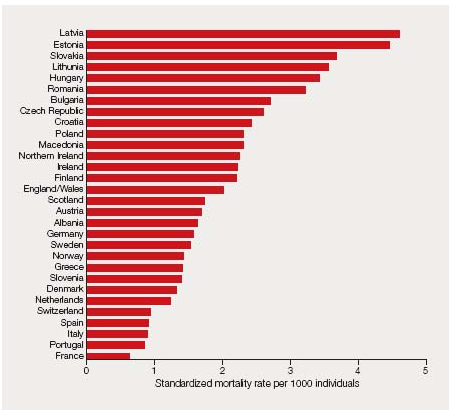 (1) CHD mortality by country, (2) cancer mortality by country. 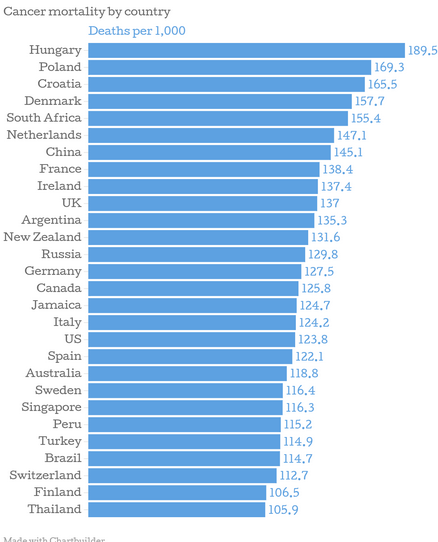 Notice how Finland is on the bottom on one chart while high on the list on the other. My personal interest in 7 Countries is the Finnish section. My mother's parents were Norwegian immigrants, and the diet we were raised on is very similar to the Finnish "white" diet. Lots of dairy, pastries, hot dogs and hamburger for meat, and canned furits and vegetables. A typical salad consisted of one lettuce leaf, topped by a piece of canned fruit, covered with cottage cheese and mayonnaise. Her family all died from CVD problems, either stroke or heart attack (though they lived to 75-85) so my concern is similar to Keys study. Marti Karvonen led the Finnish section of the study, and described the typical Finnish diet of the 1950's. The typical Scandinavian diet leaves me with good adaptation to eating lactose and gluten, but unfortunately it also points me towards overeating, obesity and eventual heart disease (and a lot of dental work). Both Cordain Paleo and Keys Med point in a better direction for health and longevity. There would also be seasonal fluctations, as seen in the chart below for Caribou (used by Cordain). Around 7% PUFA in October and 11% in April. But this is the whole carcass, which would include the brain which is the largest source of PUFA, and the bone marrow which is 70% MUFA. As regards the 7 country study, I think it would be important to not only look at the type/amount of fat, but also amount of vegetables and salt and many other things. Alkaline minerals like potassium and magnesium found abundantly in fruits and vegetables, are known to reduce blood pressure and cardiovascular disease. When Keys published his thing, the fat intake of both France and Finland was slightly less than 30% of energy, while in Italy it was 20%. Yet France had only half the rate of CHD deaths as Italians, and 1/7 that of Finland. The French diet is typically very high in saturated fats, sometimes they eat 40-45% of energy as fats, mainly animal fats like dairy fats. @giu I looked throught the USDA nutrients database to compare roast caribou (reindeer isn't listed) and roast beef tri tip. The biggest difference is in total fat, with the caribou much leaner at 4.4% total fat vs the beef at 12.4% total fat. But the beef is higher in unsat/PUFA on a percentage basis: 52% beef vs 43% caribou. You're right. Caribou is leaner and probably more like grass-fed beef, but doesn't contain much unsaturated fat. It would have been impossible for hunter gatherers to get much plant fat. They couldn't collect enough seeds or olives, and they had no way to mill them. From what I've read, Keys was pretty liberal in using olive oil in the Med Diet. In the seven countries study Greece (Crete and Corfu) was picked specifically because of the high dietary fat consumption. On Cordain´s program he does promote things like olive oil and flax oil to improve the overall fatty acid profile, i.e. to favor monounsaturated and omega-3 fatty acids. I´m not sure this is a great idea, because plant fat is not equal to animal fats, and the paleo diet would of course provide the plant fats in the form of whole foods, not vegetable oils, certainly not heated unfresh vegetable oils. When hunter gatherers ingested high amounts of fats it would usually be from animal foods, and mainly mammals which is warm blooded and have various antioxidants and a different structure of the fat so it is more stable and less prone to oxidation. Some olive oil and avocados is likely fine, and will compensate for a lack of bone marrow in the diet, but nuts should be used with caution in my opinion. I don´t think we´re adapted to eating large quantities of fish, shellfish or nuts, given the high prevalence of allergies to such foods. The seal is a mammal which may have been consumed more than fish for the groups living far north. Not sure I agree with Keys: Caribou/reindeer is a ruminant and the bacteria in their stomachs turn most of the polyunsaturated fats into saturated. So it´s not so much different from say grass fed beef. It may be slightly more unsaturated. For non-ruminants it would be a much bigger difference between north and south. Those animals (just like humans) would accumulate in their tissues the fat presented in the food they eat, and plant foods from far north is typically much higher in polyunsaturated fats than from the tropics. "Moreover the primitive Eskimoes never eat beef, pork, or dairy products, and most of the fat they eat is of the highly unsaturated type in fish and marine mammals. Even the land animals they eat, the caribou and reindeer, are not comparable to the meat animals of warmer regions. For example, the fat of the arctic land animals tends to have a low melting point, which suggests it is unusually low in saturated fats. " Keys' Med Diet and Cordain's Paleo Diet have more in common than either have with Atkins high fat diet. Cordain's advantage over both is lots of high quality meat, carbs and fat. But you have to be able to step up and pay the price to follow Cordain in this modern world. sorry for not commenting directly to Giu, but this site comments no longer work, either on Mac Yosemite nor on Linux Ubuntu. It is too bad that those plots end at around 45% fat and 45% carbos, even though they are still increasing and decreasing respectively. So we will not know what the optimal is from the data themselves. I note that one can eat up to 80% fat, in my estimate, while still intaking plenty of vitamins and minerals from low calorie vegetable foods (greens and most roots, sprouts, and berries). Problem is that there are so few population groups that eat high fat diets, so it is difficult to know. Except for the inuits there are some groups, like the Dukha from Siberia (? ), that eat large quantities of reindeer milk (but little reindeer meat), or they make it into cheese/yogurt. Reindeer milk has about 80% of energy as fats, 15-20% proteins and 0-5% carbohydrates. 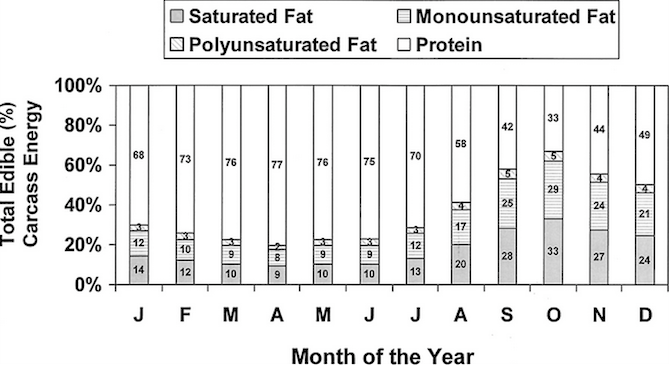 The fat is mainly saturated and monounsaturated. Wolfang Lutz (author of «life without bread»), with his 72 gram carb/day approach adopted midlife, lived to be 97 years, so it should be possible in theory to live long on a high fat diet. Not sure what he ate, but probably lots of dairy products and various fats from pork, beef etc, as most Austrians do. The life expectancy of health gurus that promote politically uncorrect diets is not very high, perhaps paritally because of all the stress they must endure. Maybe if Lutz lived in the US and his diet was extremely popular he would also die at age 72 like Robert Atkins. The problem with Atkins, however, could have been that he didn´t eat enough saturated/animal fats, like Lutz did. Loren Cordain´s suggestion is that the paleo diet derived 1/3 of energy from plant foods, and 2/3 from animal foods. In his calculations, the upper fat intake would be around 55-60% of energy during the times of the year when the animal products are high in fats (and high in saturated fats). But year round average would be much less, maybe 25-47%. I'm more of a seafood eater. The amount I eat varies with the amount I can get/afford. I think 20-25% of your food is a good everyday target (an 8 oz steak or piece of fish a day), and more than that if you're trying to lose weight without losing muscle. Good quailty protein is expensive, whether it's duck or steaks or salmon or mollusks. I feel guilty and weigh heavier when I don't get enough protein. Thhq- I see, so would you personally support a lower protein diet? What does that look like psychically, like in an average days eating? Like one steak, two maybe?